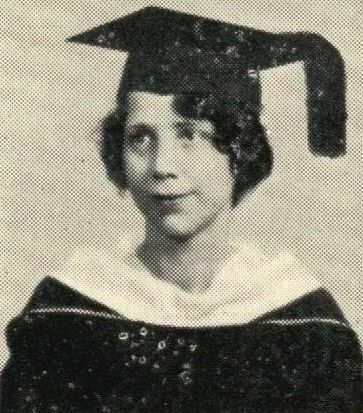 Found a tiny photo of who I think is Rose Alice in the 1931 graduation program. The 15 graduates are listed in alphabetical order and their photos appear in the same order on the next page. The original is about an inch wide. I remember driving up on a beautiful day in 1929, and we sat on some lumber and had a picnic. There was nothing up there but a big hole, and some sawdust. If my car stalled going up the hill, we'd get out and push. Going down, I'd just turn the motor off and slide, kicking up dust all the way to Sunset." That sounds like a fun-loving Mountie of the early 1930s. Someone crazy enough to roar down the mountain on a dirt road in neutral might just be someone who'd come back to leave a "memento" and cement-crusted beer can in the basement. I'm glad to make her acquaintance! And who knows... Picnics at the 1929 construction site -- the "big hole" -- would sure explain how milk bottles and other relics ended up buried in the basement.